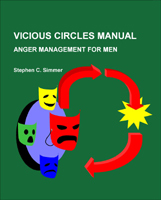 The Vicious Circles Manual is a 102-page workbook for men working on anger, including over 30 illustrations, worksheets, and motivational text. Over 3,000 of these have been sold. Click here for more information.